Silver Toshiba CB35-B3330 Chromebook 2 is a fast, sleek and modern 13.3 inch laptop with Chrome OS designed for your daily internet use- apps and programs if you are like the majority of computer users and spend your time on computer mostly on the internet with a bit of word processing, it will be more than adequate for that kind of stuff and you can even play the online games comfortably. Toshiba CB35-B3330 comes with the Intel Celeron N2840 at 2.16 GHz speed, 2 GB DDR3L SDRAM, 16 GB Solid-State Drive and naturally Chrome OS.. Although not the most powerful CPU, it is enough to run most daily things smoothly, boot up in just seconds and wake up from hibernation almost instantly with the SSD rather than a slower HDD- as most things are done online with Chromebooks anyway. The N2840 has a total max power consumption- TDP of only 7.5 watts, which contributes to much longer battery life. Although not super powerful, it is good for daily multimedia, office and internet use but not for very demanding software or the latest games though. 13.3 inch diagonal HD display with 1366x768 pixel max screen resolution unlike the Full HD IPS found on the B3340 Chromebook 2 model but still offers rich and sharp visuals (and there is a price difference for FHD) and sufficient graphics performance with the integrated Intel HD graphics that allows playing online games and streaming videos and viewing photos but not playing the advanced game titles. You’ll hear serious rich sound through its speakers (fine-tuned by Skullcandy)- great when listening to songs and watching movies. HD quality webcam with dual array built-in microphones enables easy live chats on Hangouts but not on Skype as it is still not supported on the day of this review. 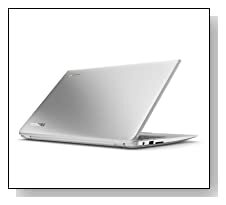 Silver Toshiba Chromebook 2 has a nice, modern and sleek design. It weighs just 3 pounds and has the dimensions of 12.60 x 8.40 x 0.76 inches- very slim and lightweight and with up to 11 hours of battery life on a single charge from its lithium ion battery, you can be out and about all day long without having to plugging it in. Connectivity options include the faster and more advanced dual antenna 802.11 A/C wireless with larger coverage that is more important than anything on such an internet based system like Chromebook, 1 x USB 2.0 port, 1 x USB 3.0 port for transferring data and charging your smart phone quicker, a full SD Card Slot, Bluetooth 4.0, an HDMI port and a Security lock. 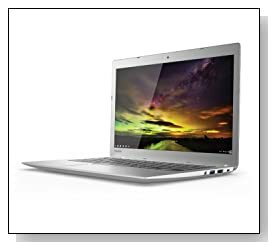 Conclusion: Toshiba CB35-B3330 Chromebook 2 is a budget, durable- well-built and super portable laptop that runs on Chrome OS that seems to be quite user-friendly and is easy to learn and helps you do things fast. You don’t need to worry about the evil attacks as it comes with the up-to-date virus protection and system updates itself regularly without you having to do anything manually and this is free of charge so you have the most up-to-date version at all times and although you can’t run the regular usual Windows apps and programs on it, you will find the Google alternatives for every single one of them. This is a very low cost machine so it would be probably unfair to expect a Full HD screen with IPS feature but if this is important for you, you can always pay extra to get the CB35-B3340 model which also comes with 4GB RAM rather than 2GB on this model. But this one is more than enough for basic daily computing- internet, office use and online games so it is up to you which one you go for.